Before rewiring any ceiling fan. Turn off electrical current at source by turning off circuit breakers. Failure to disconnect power to the ceiling fan may cause electrical shock, fire hazard, serious injury, or death. Detach switch housing and/or light kit from the ceiling fan and disconnect the kit wires. Unscrew the switch nut attached to the old fan switch. Pull down the fan switch carefully. Write down the color of each wire and the portal number to which they are attached on the switch. Remove wires from existing fan switch. If wires are hard to remove, insert a paper clip into each hole (numbered 1, 2, 3, L) and pull the wire out. Find word “STRIP” on the back of the fan switch. The lead Length on each wire to be re-attached to the new fan switch should be the same length as the line above word “STRIP”. Twist each wire and push to insert into the portal as in the previous switch (refer to step 4). Make sure that each wire has been securely attached. Unscrew nut from new fan switch. Put the wires and switch back into the switch housing. Mount the switch by feeding its threaded part through the designated hole. Attach the nut to the new fan switch. Re-connect the light kit to the ceiling fan. Connect power to the ceiling fan. Click here to purchase this fan switch. 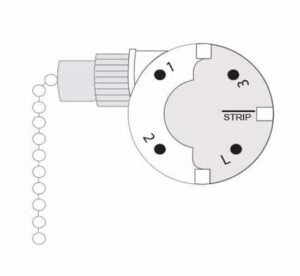 If the switch does not provide 3 speeds then it could be either a wrong replacement part or wired incorrectly. To make sure that you wired the switch properly, refer to the old switch and wire the new switch accordingly. Would you please tell me what is the part number on the old switch? What color wires go into which number. I have 1, 2, 3, L. Wire colors are green, purple, black and gray. Jack Dunnam: When I replaced this part in a Hunter fan this evening, I used 1: gray, 2: brown, 3: turquoise, 4: black. Please refer to our compatibility guide to learn more about Zing Ear ZE-268s6 switch. Some one else removed the switch and didn’t mark it . I have no idea which wire goes where or witch port is L 1 2 or 3 being as zingear does not mark their switch .i have a 5 wire CBB61 capacitor , wire colors are gray,gray,purple,brown,and red. Can you help me? How do you “securely attach each new wire” and to what? It appears that when each wire is inserted into the portal, the wire must somehow be anchored to the metal pieces that go around the switch, but it is unclear exactly how that is accomplished. When I tried, the wires kept falling out of the portal hole. I HAVE A SUPRA 32 BY MINKA AIRE FAN. NEED A NEW PULL CHAIN SWITCH. EXISTING OLD SWITCH SHOWS WU PIN E198635 WITH FOUR WIRES ATTACHED TO IT (BLACK, PURPLE, BROWN & GRAY). MANUFACTURER TELLS ME IT IS A TRIPLE CAPACITOR SWITCH. PLEASE ADVISE ME ON WHICH SWITCH TO ORDER.